Nestled between the Simonsberg and Groot Drakenstein mountain ranges and bisected by the Berg River, the lush Paarl-Franschhoek valley is one of the most picturesque locations in South Africa - and an increasingly sought-after place of residence for the country's uber-wealthy. Also known as the Valley of Life, it is home to the world-renowned and award-winning Val de Vie Winelands Lifestyle Estate, with the Boschenmeer Golf & Country Estate to the north and the Pearl Valley Golf Estate & Spa to the south, as well as a clutch of boutique wine, olive and equestrian estates around Franschhoek such as Deltacrest, Domaine de Anges and L'Avenue de Franschhoek. And while the rest of the property market continues to experience quite pedestrian growth, sales in this region are booming. 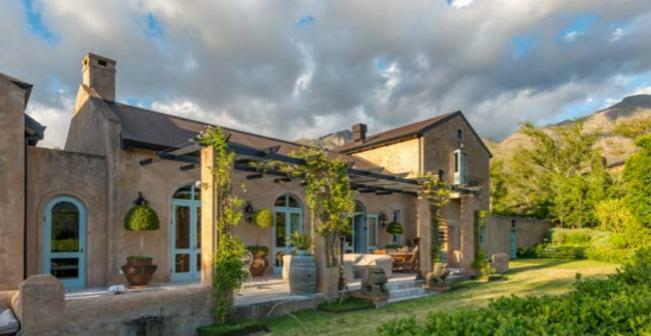 For example, Amanda Colombo and Anneke Buys, who are the local representatives of Chas Everitt International Luxury Portfolio©, sold more than R300m worth of homes just in Val de Vie last year, including a 3,2ha stand that was bought for R30m - the highest price yet paid for land in this estate. The chief reason for the brisk sales pace in the valley, they say, is the carefree, open-door lifestyle that the estates here offer their affluent residents, facilitated by state-of-the-art security and a wide range of luxury facilities, such as the polo club and fields at Val de Vie and the Jack Nicklaus signature golf course at Pearl Valley, wellness centres, spas, high-end gyms, tennis and pétanque courts and miles of scenic riding, cycling, running and walking trails. There is a golf academy in Boschenmeer, which also incorporates the Paarl Golf Club 27-hole course; a Ryk Neethling swim school in Val de Vie and a highly-regarded equestrian academy in Pearl Valley, which also boasts a Mantis Collection hotel with superb resort and conferencing facilities. These northern estates are also home to some outstanding restaurants, including the new Reuben &Co Café, the latest to be added to the portfolio of acclaimed SA chef Reuben Riffel, while the picturesque village of Franschhoek, at the southern end of the valley, is known as the culinary capital of SA and contains more than 30 restaurants, cafés, bakeries and chocolatiers. Franschhoek is also a major tourism centre of course, as it is the gateway to several wine routes showcasing the Huguenot history of the region and incorporating some of the Cape's oldest and most distinguished estates. It also hosts two international festivals a year - the Franschhoek Literary Festival in May and the Bastille Day Festival in July - and is just 10 minutes from the highly-rated Bridge House private school. Indeed, says Amanda Colombo, the proximity of excellent schools where entrance is relatively easy is another big draw card for the valley. "While the number of high-end buyers relocating from Gauteng and other inland provinces has abated somewhat recently, that gap has easily been filled by a string of buyers relocating from Cape Town's plush Southern Suburbs and Atlantic Seaboard areas, where there are long waiting lists for the top schools." Other sought-after schools in the region include the Simond Private School in Simondium, and the La Rochelle Girls' High and Paarl Boys' High schools in Paarl - which incidentally also offers upmarket shopping malls and two private medical centres. Meanwhile a spate of new developments are set to extend the accessibility of the region to a wider range of residents, offering new homes in Paarl at prices from around R1,85m, homes in Franschhoek from around R2,9m and homes in Val de Vie at prices from around R6m. Two years ago Val de Vie also added an Evergreen retirement village to its range of residential offerings, and this recently led to the estate winning the Best Multi-Generational Estate in the World award (https://bit.ly/2slMP0X) to add to its other accolades as the most secure estate in Africa and the number one residential estate in SA - and will no doubt continue to shine a flattering spotlight on the Valley of Life.